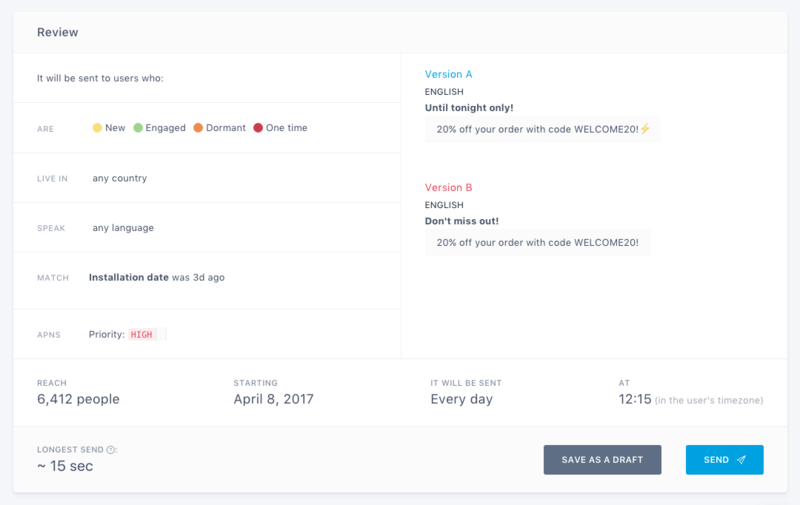 Batch handles all the tricky scheduling and timezones issues for you. Our technology makes sure your users always receive their message when you want them to, whether it's a hot news, a scheduled announcement or a recurring message. Simply choose the time, select a few simple options and forget about it. We’ll take care of the rest. Send a push notification instantly to your users regardless of their timezone. This is the best option if you work in the media and want to be the first to announce breaking news. The Local Time option lets you send a push notification that will be received at the same hour in every country. This ensures that marketing efforts target your users at a uniform time. 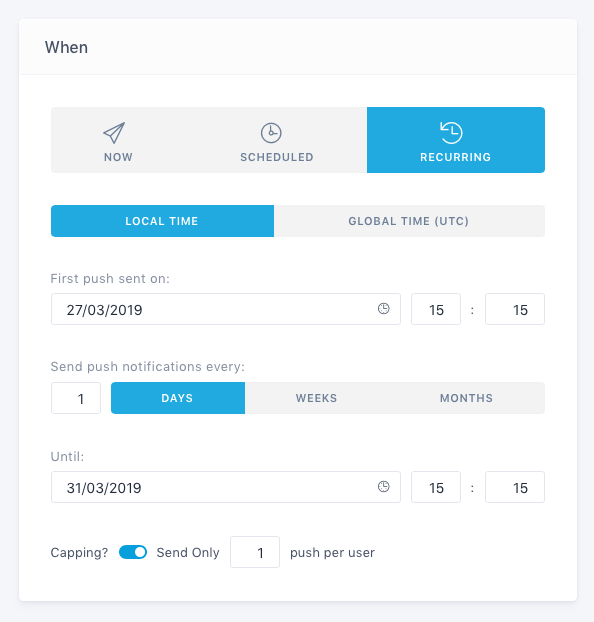 When you choose a specific date and time, Batch will send the first notifications at the chosen time starting with users just west of the International Dateline (GMT+12) and each hour afterwards for 24 hours until the conclusion of the campaign. For example, if your push campaign is scheduled to be sent on Friday, July 19th at 6pm, your American, French and Chinese users will receive it on Friday, July 19th when it's 6pm in their country. If you set a specific date and time and the date/time you've selected has already passed for a particular time-zone, the campaign will not deliver a push to the users within that time-zone unless they are within 30 minutes of the campaign start time. This safety net will catch any users that might have been missed and deliver the push, though you should avoid setting last-minute campaigns, as they could be delivered at undesired times. The Global Time (UTC) option allows you to send a push notification to your users at a specific UTC time regardless of their location. 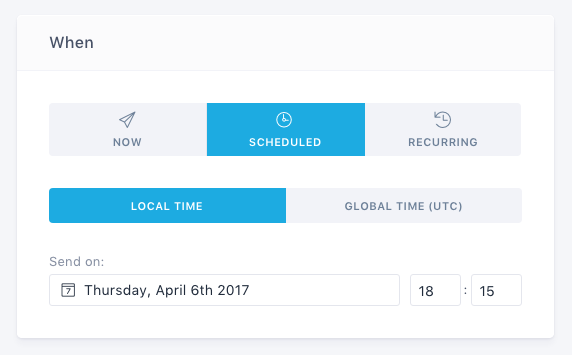 You can create push campaigns that repeat at specified intervals based on your users' local time or on global time (UTC). You can also use a capping to limit the number of times users receive a recurring push notification. Sent every week/month to your inactive users. You can either target specific Smart Segments or use the Last visit date native attribute. You can send a notification every weekend to the users in the Dormant segment, with a capping of 3 to make sure you don't overpush them. 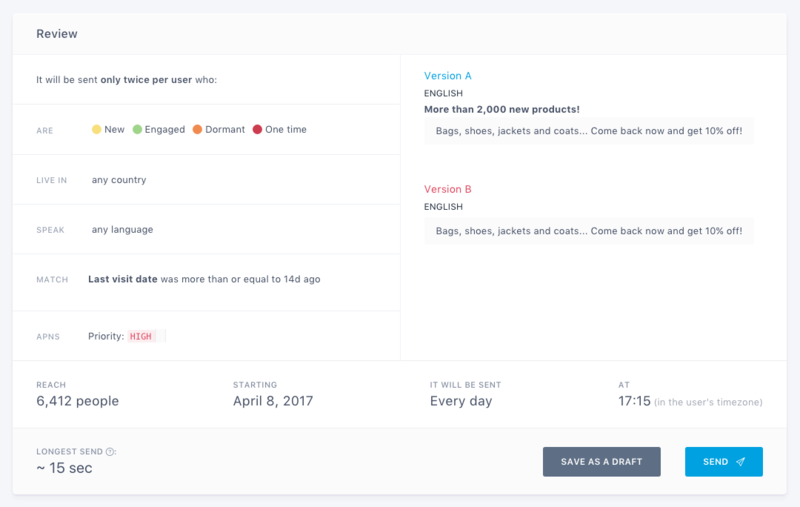 The installation date: Allows you to create a complete onboarding flow with notifications sent on day 1, 3, 7 after the install. The last visit date: Recommended if you want to push users who are becoming dormant (e.g. 10 days after the last visit). A custom attribute: To create push scenarios based on custom data. Example: Automatically push users who haven't made a purchase in 20 days. Onboarding notifications should be sent everyday, with a capping of 1. This will make sure the notification is sent at the right moment for each user, and only once. Please note that your campaign capping will not work if you target the Imported segment. Frequency capping: We recommend you ser a global frequency capping if you want to limit the number of notifications a device can receive in a customisable time frame.